Hozier's sophomore album Wasteland, Baby! is out now. Hozier had a swift rise to fame. His song "Take Me To Church" became an instantaneous hit six years ago. The following year, the Irish singer and songwriter released his self-titled debut album, sold out world tours, Grammy nomination and an ever-growing fan base following. And now, Hozier, whose full name is Andrew Hozier-Byrne, is out with his sophomore album. It's called "Wasteland, Baby!" HOZIER: (Singing) I came in from the outside, burnt out from a joyride. She likes to roll here in my ashes anyway. Played from the bedside, "Stella By Starlight," "That Was My Heart," the drums that start off "Night And Day." SIMON: Hozier joins us from New York. Thanks so much for being with us. HOZIER: It's a pleasure. Thank you so much for having me. SIMON: So what's it like to have a big hit in your early 20s? What do you learn when, in a sense, maybe you're not ready for it? HOZIER: Yeah. I mean, you sure as heck learn that you're not ready for it. And I think you learn by doing. I think with a song like that - that was the first song I ever released. When something like that happens, you just meet it. And, you know, you learn by doing. I had to assemble a band very quickly and get on the road. SIMON: A lot of social issues and politics make it into your music, doesn't it? HOZIER: It does. It would never be for its own sake. I think, for me, it's really just a case of wanting to be honest about how you experience the world around you and what's going on in the world around you. And sometimes, that can be interpreted. There's political elements at play there, but, to me, I think all music, whether it's intentional or not, will have a political dimension, you know? HOZIER: (Singing) All the fear and the fire of the end of the world happens each time a boy falls in love with a girl, happens great, happens sweet. Happily, I'm unfazed here, too. The title track plays around with some of the anxieties and concerns. HOZIER: (Singing) Wasteland, baby, I'm in love, I'm in love with you. For me, it was really just looking into and confronting the concerns of the worst-case scenarios. I think it was written around the time that the doomsday clock was moved two minutes to midnight. And, you know, there's been kind of increasing stories of what might lie ahead with regards to climate crises, political crises. There was talk of nuclear escalation, et cetera. So it was really just confronting those concerns and putting them on paper in no metaphorical way - in quite a literal way - and then still trying to find in that worst-case scenario the warm, still-beating heart of humanity there, and something that's in the kindness and the warmth and the capability of people to, even in the imagined last moments, to still issue a squeeze of the hand, as it were. HOZIER: (Singing) Are the death of all things that are seen and unseen not an end, but the start of all things that are left to do? SIMON: I gather you grew up in an artsy family. HOZIER: I did a bit, yeah. SIMON: Your father's a musician, right? HOZIER: Yeah. He was a drummer, played in a lot of live bands kind of in the Dublin live scene before I was born, primarily blues music, I suppose. SIMON: A Dublin blues drummer. SIMON: I guess I'm not sure I've heard the phrase. HOZIER: I know. They were there - kind of The Commitments era, I suppose. SIMON: Yeah. And your mother an artist? HOZIER: Yeah. She was always a visual artist. SIMON: Were they, may I ask, happy for you to become a musician? Or, like a lot of professional artists, would they have preferred you become - I don't know - a tax accountant or something like that? HOZIER: I think initially, yeah, they always steered me towards academic success and to have, I suppose, a baseline of a degree, you know? And I did leave college. I went to study music in Trinity College Dublin. I can't say I was there for too long, so it was - they were very supportive, but it was a difficult conversation to convince them that this was something I really wanted, I felt I needed to do. SIMON: And has the moment come when your parents said to you, all right, son, maybe you had a good idea? HOZIER: Nearly. We're nearly there. HOZIER: I'm kidding. I'm kidding. We'll get there. SIMON: Well, maybe this album will do really well, and they'll be convinced. HOZIER: (Singing) It's not the waking, it's the rising. It is the grounding of a foot uncompromising. SIMON: I want to ask you about another song, if we could. This one - "Nina Cried Power." HOZIER: (Singing) And I could cry power, power, power. Curtis cried power. Patti cried power. Nina cried power. HOZIER: That is Mavis Staples. That is the one and only. SIMON: Yeah. And Booker T. Jones is also on this album. HOZIER: He is, indeed. Yeah, it was a dream. It was an absolute dream of mine to work with both of those artists. SIMON: This song's a tribute. HOZIER: Yeah. I characterize it as such in my mind - as a kind of thank-you note. And it kind of looks to the kind of the spirit of work in particularly the 20th century of artists who openly just wrote and sang about things that they felt it was important to. SIMON: Like Nina Simone, Marvin Gaye. HOZIER: Nina Simone, Marvin Gaye, Billie Holiday is referenced in there. Woody Guthrie would be - is in there. John Lennon, Bob Dylan. HOZIER: Mavis Staples, of course, who, I think, embodies that, you know? If there is a starting point in looking to that, that's writing songs that The Staple Singers wrote. That's moral leadership. That's bravery. And that's something to - that's something that can be looked to. SIMON: Is there a message in this album, or do you avoid the word? 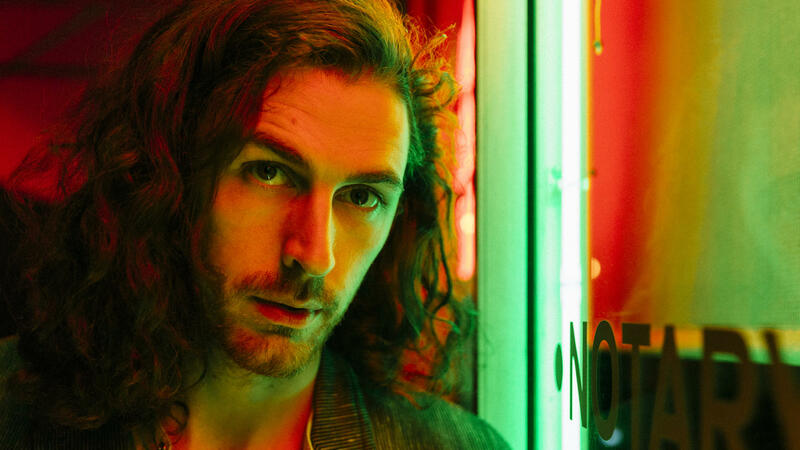 HOZIER: I would resist the word message, I think, because it would be a very, very difficult thing to sum up what that would be or what a singular message would be. There's moments on the record that speak to the limitations of even singing or writing songs and the limitations of ourselves and the limitations of even love as a bound for the difficult, kind of tumultuous times that we might live in. But I think, if nothing else, I do think it's a hopeful record, and it's an optimistic record. It's always trying to look to, as I said, just the warm center of all of us and people's capacity for love and people's capacity for kindness, even in the worst-case scenarios, you know? SIMON: Capacity for love and capacity for kindness, even if we think we're surrounded by a lot of contrary examples. HOZIER: (Singing) I still watch you when you're grooving. As if through water from the bottom of a pool, you're moving without moving. SIMON: Hozier, the Irish singer and songwriter, Andrew Hozier-Byrne. His latest album, "Wasteland, Baby!" Thanks so much for being with us. HOZIER: It's a pleasure. Thank you so much. HOZIER: (Singing) When you move, I could never define all that you are to me. So move me, baby. Shake like the bough of a willow tree. Transcript provided by NPR, Copyright NPR.